Shocking viral footage emerged online showing an alleged pickpocket - handcuffed and sitting on the floor barefoot - screaming hysterically as another officer shouts abuse at a police station in restive Papua province. "How many times have you stolen a mobile phone?" he yells at the unidentified suspected thief, who appears to be cowering in fear. "Only two times," the suspect says in response. "An officer is now being questioned by Papua police internal affairs division," Papua police spokesman Ahmad Mustofa Kamal told AFP Monday. But he added that the suspect was not in physical danger from the serpent. "The snake was tame and not poisonous or dangerous and the incident was their own idea so they could get admission of guilt as quick as possible," Swadaya said in a statement. Indonesian security forces have been repeatedly accused of using excessive force and committing rights abuses against Papua's ethnic Melanesian population including extrajudicial killings of activists and peaceful protestors. 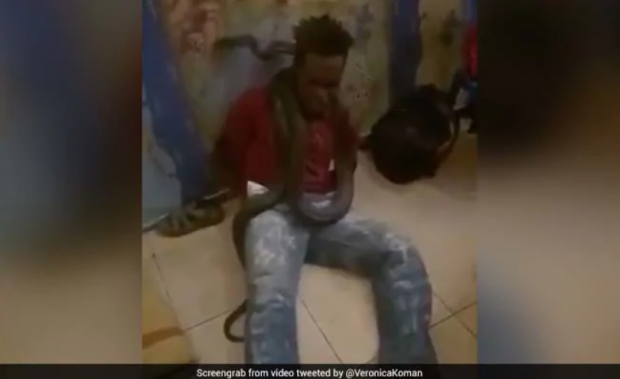 "They have long known that snakes are being used by police and the military (in interrogations)," she said. "So they're not surprised" by the video.